So, how long has it been since you cleaned that carpet? If you are like most people you make sure that it is cleaned by a professional at least two to three times a year. In many cases, however, it often goes without cleaning. The fact remains, carpet cleaning in Lake Stevens, WA is something that everyone has to do. However, many people think that cleaning a carpet is something that you can do yourself. This is not the case. Getting a carpet cleaned needs a special skill and many people who try to do it without the help of a professional soon find out that the do more damage to their carpet than they should. There are so many factors that go into cleaning a carpet. You have to think about the fibers that make up the carpet and the backing of the carpet and all kinds of other factors. Depending on what the carpet is made from, our carpet cleaning Lake Stevens, WA professional will know the best way to clean it. Only a professional knows the best cleaning supplies to use. Many people think that all carpets are cleaned the same way. Many people think it is perfectly fine to throw a commercial chemical on the carpet that they picked up at the grocery store. This is simply not the case and most often results in damage to the carpet or rugs. For Best Results Use A Professional. Now that you know this information about cleaning a carpet, you should give us a call. This is very cost effective too. 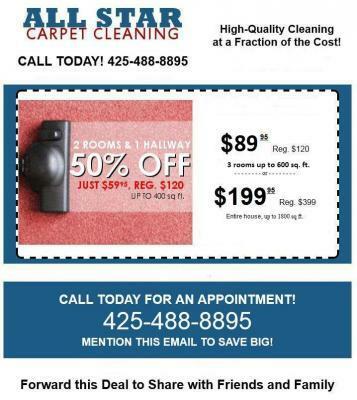 Keep in mind that it saves you money and time when you use our carpet cleaning Lake Stevens, WA service. You are also assured that you are getting a clean carpet with no damage.